Theotokos (Greek Θεοτόκος Greek pronunciation: [θeoˈtokos]) is a title of Mary, mother of Jesus, used especially in Eastern Christianity. The usual Latin translations, Dei Genetrix or Deipara (approximately "parent (fem.) of God", are translated as "Mother of God" or "God-bearer". The Council of Ephesus decreed in 431 that Mary is the Theotokos because her son Jesus is both God and man: one divine person with two natures (divine and human) intimately and hypostatically united. 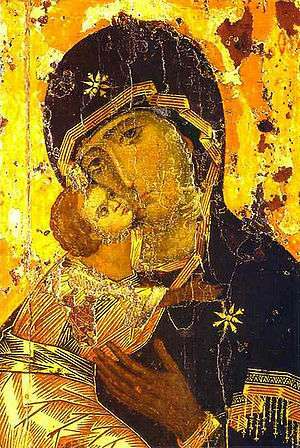 Theotokos is also used as the term for an Eastern icon, or type of icon, of the Mother with Child (in the western tradition typically called a Madonna, as in "the Theotokos of Vladimir" both for the original 12th-century icon and for icons that are copies or imitate its composition. Similar to this is the title of Mother of God (Greek Μήτηρ (του) Θεοῦ; abbreviated ΜΡ ΘΥ, Latin Mater Dei). "Mother of God" (and equivalents) is most often used in English (and other modern western languages), largely due to the lack of a satisfactory equivalent of Greek τόκος / Latin genetrix. The title has been in use since the 3rd century, in the Syriac tradition (as Syriac: ܝܳܠܕܰܬ ܐܰܠܳܗܳܐ‎, translit. Yoldath Alloho) in the Liturgy of Mari and Addai (3rd century) and the Liturgy of St James (4th century). Theotokos is an adjectival compound of two the Greek words Θεός "God" and τόκος "childbirth, parturition; offspring". A close paraphrase would be "[she] whose offspring is God" or "[she] who gave birth to one who was God". The usual English translation is simply "Mother of God"; Latin uses Deipara or Dei Genetrix. The Church Slavonic translation is Bogoroditsa (Russian/Macedonian/Bulgarian Богородица). The full title of Mary in Slavic Orthodox tradition is Прест҃а́ѧ влⷣчица на́ша бцⷣа и҆ прⷭ҇нод҃ва мр҃і́а (Russian Пресвятая Владычица наша Богородица и Приснодева Мария), from Greek Ὑπεραγία δεσποινίς ἡμῶν Θεοτόκος καὶ ἀειπαρθένος Μαρία "Our Most Holy Lady Theotokos and Ever-Virgin Mary". German has the translation Gottesgebärerin. Variant forms are the compounds Θεομήτωρ (translit. Theomētor; also spelled Θεομήτηρ, translit. Theomētēr) and Μητρόθεος (translit. Mētrotheos), which are found in patristic and liturgical texts. Theologically, the term "Mother of God" (and its variants) should not be taken to imply that Mary is the source of the existence of the divine person of Jesus, who existed with the Father from all eternity, or of her Son's divinity. Within the Orthodox and Catholic tradition, Mother of God has not been understood, nor been intended to be understood, as referring to Mary as Mother of God from eternity — that is, as Mother of God the Father — but only with reference to the birth of Jesus, that is, the Incarnation. To make it explicit, it is sometimes translated Mother of God Incarnate. (c.f. the topic of Christology, and the titles of God the Son and Son of man). 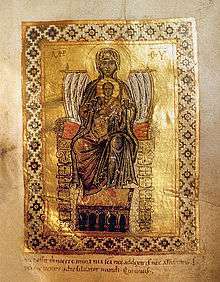 The status of Mary as Theotokos was a topic of theological dispute in the 4th and 5th centuries, and was the subject of the decree of the Council of Ephesus of 431, to the effect that, in opposition to those who denied Mary the title Theotokos ("the one who gives birth to God") but called her Christotokos ("the one who gives birth to Christ"), that Mary is Theotokos because her son Jesus is one person who is both God and man, divine and human. 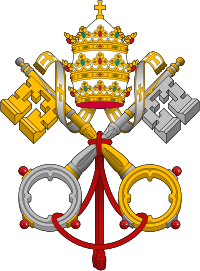 This decree created the Nestorian Schism. Cyril of Alexandria wrote, "I am amazed that there are some who are entirely in doubt as to whether the holy Virgin should be called Theotokos or not. For if our Lord Jesus Christ is God, how is the holy Virgin who gave [Him] birth, not [Theotokos]?" (Epistle 1, to the monks of Egypt; PG 77:13B). But the argument of Nestorius was that divine and human natures of Christ were distinct, and while Mary is evidently the Christotokos (bearer of Christ), it could be misleading to describe her as the "bearer of God". At issue is the interpretation of the Incarnation, and the nature of the hypostatic union of Christ's human and divine natures between Christ's conception and birth. The term was certainly in use by the 3rd century. 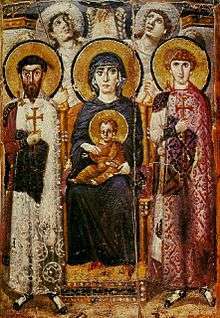 Athanasius of Alexandria in 330, Gregory the Theologian in 370, John Chrysostom in 400, and Augustine all used theotokos. The Greek version of the hymn Sub tuum praesidium contains the term, in the vocative, as ΘΕΟΤΟΚΕ. The oldest record of this hymn is a papyrus found in Egypt, mostly dated to after 450 . but according to a suggestion by de Villiers (2011) possibly older, dating to the mid-3rd century. The Syrian Church the Nestorian Church, known as the Church of the East within the Syrian tradition, rejected the decision of the Council of Ephesus and its confirmation at the Council of Chalcedon in 451. This was the church of the Sassanid Empire during the late 5th and early 6th centuries. 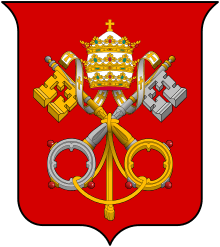 The schism ended in 544, when patriarch Aba I ratified the decision of Chalcedon. After this, there was no longer technically any "Nestorian Church", i.e. a church following the doctrine of Nestorianism, although legends persisted that still further to the east such a church was still in existence (associated in particular with the figure of Prester John), and the label of "Nestorian" continued to be applied even though it was technically no longer correct. Modern research suggests that also the Church of the East in China did not teach a doctrine of two distinct natures of Christ." The Solemnity of Mary, Mother of God is a Roman Catholic feast day introduced in 1969, based on older traditions associating 1 January with the motherhood of Mary. One of the two earliest known depictions of the Virgin Mary is found in the Catacomb of Priscilla (3rd century) showing the adoration of the Magi. Recent conservation work at the Catacombs of Priscilla revealed that what had been identified for decades as the earliest image of the Virgin and Child was actually a traditional funerary image of a Roman matron; the pointing figure with her, formerly identified as a prophet, was shown to have had its arm position adjusted and the star he was supposedly pointing to was painted in at a later date. The putative Annunciation scene at Priscilla is also now recognized as yet another Roman matron with accompanying figure and not the Virgin Mary. Recently another third-century image of the Virgin Mary was identified at the eastern Syrian site of Dura Europos in the baptistry room of the earliest known Christian Church. The scene shows the Annunciation to the Virgin. The tradition of Marian veneration was greatly expanded only with the affirmation of her status as Theotokos in 431. The mosaics in Santa Maria Maggiore in Rome, dating from 432-40, just after the council, does not yet show her with a halo. 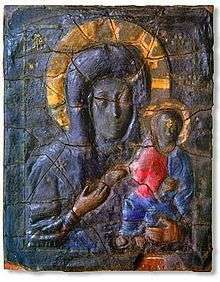 The iconographic tradition of the Theotokos or Madonna (Our Lady), showing the Virgin entrhoned carrying the infant Christ, is established by the following century, as attested by a very small number of surviving icons, including one at Saint Catherine's Monastery in Sinai, and Salus Populi Romani, a 5th or 6th-century Byzantine icon preserved in Rome. 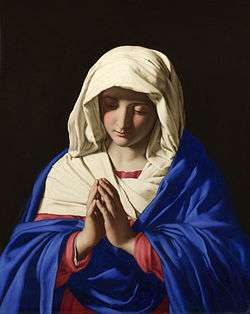 This type of depiction, with subtly changing differences of emphasis, has remained the mainstay of depictions of Mary to the present day. 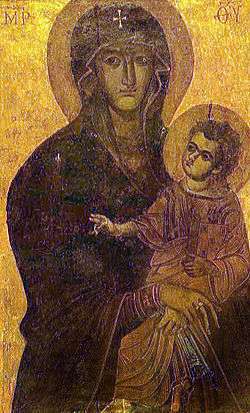 The roughly half-dozen varied icons of the Virgin and Child in Rome from the 6th to 8th centuries form the majority of the representations surviving from this period, as most early Byzantine icons were destroyed in the Byzantine Iconoclasm of the 8th and 9th century, notable exceptions being the 7th-century Blachernitissa and Agiosoritissa. The iconographic tradition is well developed by the early medieval period. The tradition of Luke the Evangelist being the to have painted Mary is established by the 8th century. An early icon of the Virgin as queen is in the church of Santa Maria in Trastevere in Rome, datable to 705-707 by the kneeling figure of Pope John VII, a notable promoter of the cult of the Virgin, to whom the infant Christ reaches his hand. The earliest surviving image in a Western illuminated manuscript of the Madonna and Child comes from the Book of Kells of about 800 (there is a similar carved image on the lid of St Cuthbert's coffin of 698). 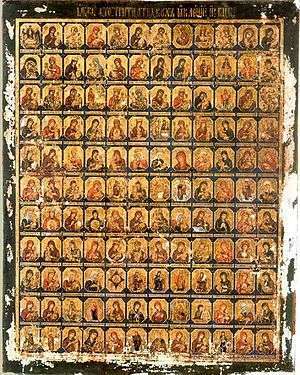 The oldest Russian icons were imports from Byzantium, beginning in the 11th century. ↑ English pronunciation: /ˌθiːəˈtoʊkoʊs, ˌθeɪə-, -ˈtɒ-, -kəs/; "Theotokos". Merriam-Webster Dictionary. "Theotokos". Dictionary.com Unabridged. Random House. ↑ Ph. Schaff, H Wace Nicene and Ante-Nicene Fathers, II.XIV ("Excursus on the Word Θεοτόκος") object to "God-bearer" being characterised as "exact translation", as the literal equivalent of "God-bearer" is Θεοφόρος, not Θεοτόκος. Greek Θεοτόκος is a feminine adjectival compound translating "she whose offspring is God". J.F. Bethune-Baker, Nestorius and His Teachings: A Fresh Examination of the Evidence (1998), p. 58 ( "who gave birth to one who was God", "whose child was God"). 1 2 "NPNF2-14. The Seven Ecumenical Councils - Christian Classics Ethereal Library". Ccel.org. 2005-06-01. Retrieved 2012-10-04. ↑ Addai and Mari, Liturgy of. Cross, F. L., ed. The Oxford Dictionary of the Christian Church. Oxford University Press. 2005. "Book for people in English". Kaldu.org. Retrieved 2013-11-03. ↑ John Witvliet, "The Anaphora of St. James" in ed. F. Bradshaw Essays on Early Eastern Eucharistic Prayers, 1997. "CHURCH FATHERS: Divine Liturgy of St. James". Newadvent.org. Retrieved 2013-11-03. ↑ J.F. Bethune-Baker, Nestorius and His Teachings: A Fresh Examination of the Evidence (1998), p. 58 ( "who gave birth to one who was God", "whose child was God"). Pelikan, Jaroslav (1998). Mary Through the Centuries. Yale University Press. p. 55. ISBN 978-0-300-07661-5. ↑ Богоматерь-Богородица Энциклопедический словарь Брокгауза и Ефрона : в 86 т. (82 т. и 4 доп.). — СПб., 1890—1907. ↑ "Pearson is mistaken in supposing that the resolution of the compound Theotocos into μήτηρ τοῦ Θεοῦ was unknown to the early Greek writers. [...] It is not an open question whether Mater Dei, Dei Genetrix, Deipara, μήτηρ τοῦ Θεοῦ are proper equivalents for Θεοτόκος. This point has been settled by the unvarying use of the whole Church of God throughout all the ages from that day to this, but there is, or at least some persons have thought that there was, some question as to how Theotocos should be translated into English. Throughout this volume I have translated it 'Mother of God,' and I propose giving my reasons for considering this the only accurate translation of the word, both from a lexico-graphical and from a theological point of view. (a) It is evident that the word is a composite formed of Θεός = God, and τίκτειν = to be the mother of a child. Now I have translated the verbal part 'to be the mother of a child' because 'to bear' in English does not necessarily carry the full meaning of the Greek word, which (as Bp. Pearson has well remarked in the passage cited above) includes 'conception, nutrition, and parturition.' It has been suggested that 'God-bearer' is an exact translation. To this I object, that in the first place it is not English; and in the second that it would be an equally and, to my mind, more accurate translation of Θεοφόρος than of Θεοτόκος. Another suggestion is that it be rendered 'the bringer forth of God.' Again I object that, from a rhetorical standpoint, the expression is very open to criticism; and from a lexicographical point of view it is entirely inadequate, for while indeed the parturition does necessarily involve in the course of nature the previous conception and nutrition, it certainly does not express it. Now the word Mother does necessarily express all three of these when used in relation to her child. The reader will remember that the question I am discussing is not whether Mary can properly be called the Mother of God; this Nestorius denied and many in ancient and modern times have been found to agree with him. [...] (b) It only remains to consider whether there is from a theological point of view any objection to the translation, 'Mother of God.' It is true that some persons have thought that such a rendering implied that the Godhead has its origin in Mary, but this was the very objection which Nestorius and his followers urged against the word Theotocos, and this being the case, it constitutes a strong argument in favour of the accuracy of the rendering. Of course the answer to the objection in each case is the same, it is not of the Godhead that Mary is the Mother, but of the Incarnate Son, who is God. 'Mother' expresses exactly the relation to the incarnate Son which St. Cyril, the Council of Ephesus, and all succeeding, not to say also preceding, ages of Catholics, rightly or wrongly, ascribe to Mary. [...]" Ph. Schaff, H Wace (eds. ), Early Church Fathers, Nicene and Ante-Nicene Fathers, Ser. II, Vol. 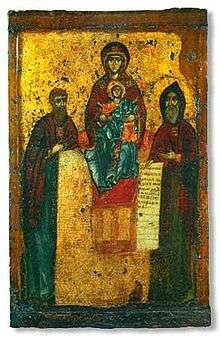 XIV, "Excursus on the Word Θεοτόκος"
↑ "The rejection of the term Theotokos by Nestorius Constantinople and the refutation of his teaching by Cyril of Alexandria". Egolpion.com. 2012-06-24. Retrieved 2012-10-04. 1 2 de Villiers, Henri (2011-02-03). "The Sub Tuum Praesidium". New Liturgical Movement. Retrieved 2012-10-04. .
↑ G. Vannucci, Marianum, 1941 (3), pp. 97-101, "La piu antica preghiera alla Madre de Dio". P. Ryl. Gr. 3 470 (Roberts, Colin Henderson) = Le Muséon 52 (1939), p. 229-233 (Mercenier, P. F. ) = Zeitschrift für Katholische Theologie 74 (1952), p. 76-82 (Stegmüller, Otto). "Date: AD 450 - 799". ↑ Basely, Joel R. (2005). Festival Sermons of Martin Luther. Dearborn, Michigan: Mark V Publiscations. p. 167. ISBN 0-9652403-1-2. ↑ Geri Parlby, “The Origins of Marian Art in the Catacombs and the Problems of Identification,” in Chris Maunder, ed., Origins of the Cult of the Virgin Mary (London: Bloomsbury Academic, 2008) 41-56. ↑ Michele Bacci, Il pennello dell'Evangelista. Storia delle immagini sacre attribuite a san Luca (Pisa: Gisem, 1998). Look up Mother of God in Wiktionary, the free dictionary.